Best annuity rates reduced by 1.91% in February following political uncertainty in Europe, wage data in the US pointing to lower inflation and worries over President Trump's economic policies sending gilt yields to the lowest level for the year. Gilts and bonds ended February lower as investors seek safe havens as European politics in France, Germany and Italy create uncertainty over future elections. The 15-year gilt yields reduced 29 basis points from 1.79% to a low for the year of 1.50%. As a general rule a fall of 29 basis points would result in annuity rates reducing by 2.9% and providers have been actively reducing rates in February. 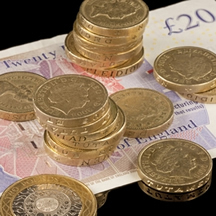 Standard annuities are lower by an average of 1.91% and could fall a further 0.99% in March. 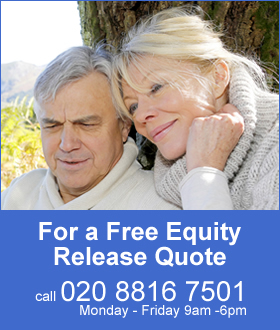 This ends a five month run of increasing annuity rates. Smoker and enhanced annuities are down by a smaller amount of 0.44% for the month and could fall another 2.46% should yields remain at current levels or decrease further. 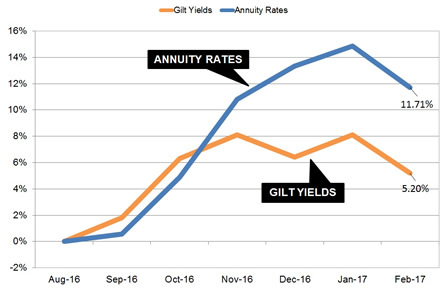 The sudden fall in gilt yields in February leaves room for providers to reduce rates across the board in March for both standard and enhanced rates. The above chart shows how our benchmark example reduced by 2.74% and has closely matched the 29 basis point fall in yields although the average fall for standard annuities is 1.91%. This means there is likely to be further falls in rates of about 0.99% to follow in March. Our benchmark example for a person aged 65 with £100,000 buying a single life, level annuity would receive £5,394 pa in January falling by £148 pa to £5,246 in February. Gilt yields reached an all time low in August last year of 0.98% following the EU referendum and our benchmark example was as low as £4,696 pa before recovering significantly towards the end of the year up almost 15% on average. For the benchmark example in terms of lifetime income, the Office of National Statistics (ONS) would expect a male to live for 17.3 years and he will have £2,560 more over his lifetime. For a female she can expected to live for 20.4 years increasing her income by £3,019. For smoker and enhanced annuities the fall was less on average at 0.44% suggesting a larger fall can be expected in March of up to 2.46% if yields remain at current levels or decrease further. Gilt yields and annuity rates increased after August as investors expected the Federal Reserve would increase interest rates before the end of the year with a Trump victory, improved economic outlook in Germany and rising crude oil prices pushing up inflation. Since then ther has been greater political uncertainty and investors are moving funds to safe havens including buying gilts and bonds. In Europe a referendum vote last year against the Italian Prime Minister Matteo Renzi to reform the constitution resulted with him leaving office. This has been followed by the German elections later this year and polls showing German Chancellor Angela Merkel losing ground on the Social Democratic Party candidate. In France polls show Marine Le Pen has been gaining ground ahead of their election and this highlights a risk for investors as she has championed pulling the country out of the European Union. For the US disappointing wage growth data suggesting inflation would not rise at a level to see higher interest rates from the Federal Reserve until much later in the year. There was also uncertainty over the President Donald Trump's promised pro-growth policies including cuts to corporation tax and infrastructure spending with a lack of clarity presented by the administration. Annuity rates are certain to fall further in March if gilt yields do not recover and with elections in Europe later in the year investors are likely to be cautious until the outcome is known.